Nature and time have proved the culprits: the vaulting protecting the 98-foot (30-meter-long) relief collapsed, exposing the wall to monsoon torrents, which seeped downwards to wash away the masonry and loosen the foundations. Pressure from the weight above toppled sections of the wall or forced it to lean. "He's going to have to come down," says the 68-year-old architect of the king's image. A section of the wall is angled dangerously outward, he explains, so it must be dismantled, the foundations reinforced and the sandstone blocks meticulously numbered, charted, then set back into place. Nearby, two young Cambodian computer whizzes are pioneering a shortcut to the reassembly process through three-dimensional imaging. The work-in-progress is one of the temple's 34 towers recently damaged in a severe storm. Some 700 stone blocks from the tower have been removed or collected from where they fell and each one will be videographed from every angle. Since like a human fingerprint, no stone is exactly alike, still-to-be-finalized software should be able to fit all the blocks into their original alignment after they are repaired. "We hope that with one push of the button all the stones will jump into place to solve what we are calling 'John's puzzle,'" says Sanday. 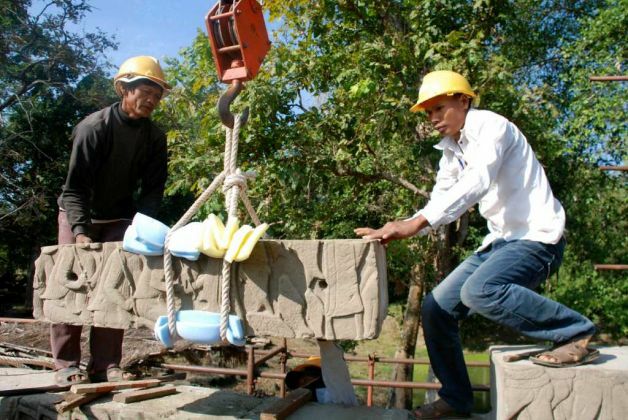 When an original block has gone missing or is beyond repair, either an original stone from elsewhere on the site is used or, as a last resort, a new stone will be inserted. "My philosophy is to preserve and present the monuments as I found them for future generations without falsifying their history. So often people tend to guess what was there," he says. The Global Heritage Fund, he says, is also intent on involving the community. 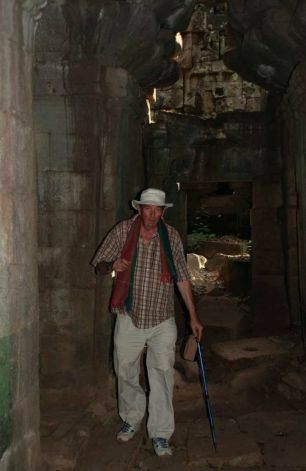 "We can't protect Banteay Chhmar. They have to be the protectors. So they must gain some revenue from the temple," Sanday says. The Community Based Tourism group, which the fund supports, is training locals to become guides and devising ways to derive more income from tourism, part of which is funneled into betterment of the entire village. Sanday and local organizers, however, hope Banteay Chhmar's remote location will spare it from a mass tourist influx. 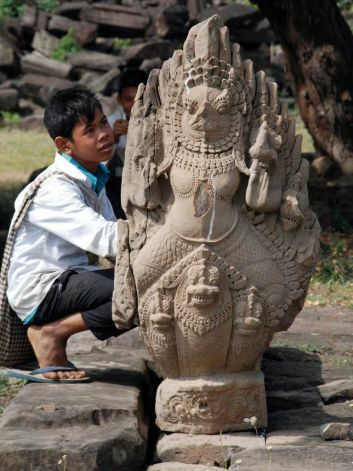 Thus he is not keen to have it listed as a UNESCO World Heritage Site, something the Cambodian government is pushing for. "I often come here in the late afternoons, when the birds come alive and a breeze stirs," Sanday says as fading sun rays, filtered through the green canopy, dapple the gray, weathered stones. 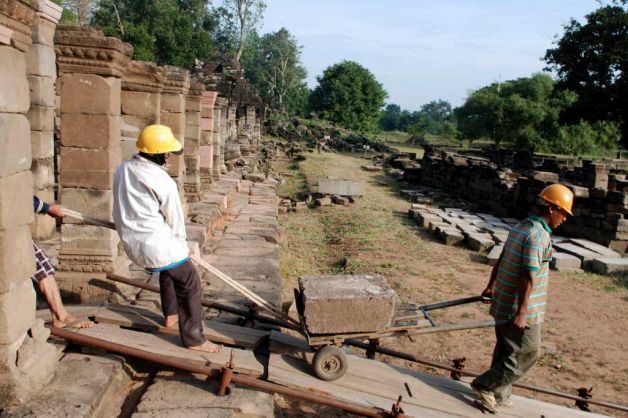 "It's peaceful and quiet here, like it used to be at Angkor. This is a real site."